In my earlier article, I’ve guided you with step by step instructions on creating your first ASP.Net web forms application with jQuery-UI. Here is the sample source code for the Site.Master and Default.aspx file in the instructions. Use this code and follow the step by step instructions explained in jQuery UI with ASP.NET – Step by Step Instruction. 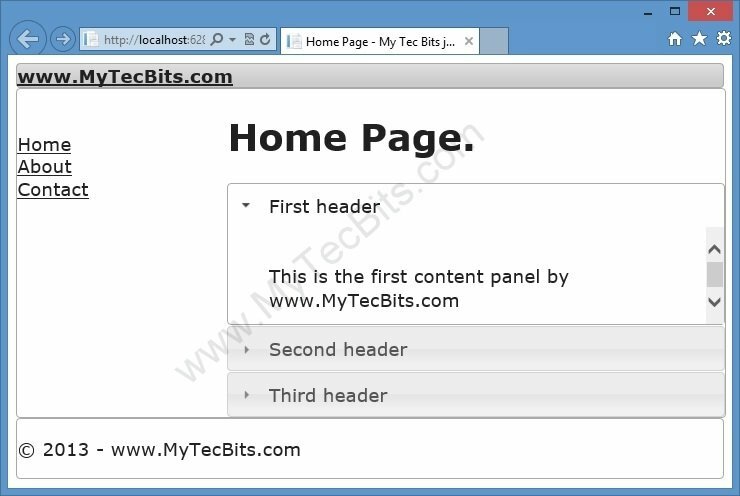 Instructions for using the above sample source code is explained in jQuery UI with ASP.NET – Step by Step Instruction. Read the article jQuery UI with ASP.NET – Step by Step Instruction for the instructions on using this code.